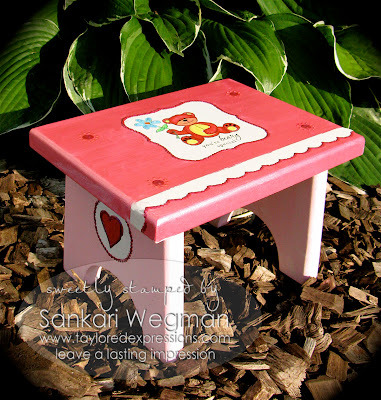 I saw this little footstool over at Target the other day and couldn't wait to transform it into something "beary special" ;) using Taylor's sweet Beary Special Stamps and Beary Special Accessories stamp set. I love using these stamps because they were created to be part of Taylor's Charitable Giving Tree and a portion of both of these stamps will go to benefit the Hospital for Sick Kids - you can Check out Taylor's Blog Post for more information about the Charitable Giving Tree and this beautiful cause. 1. I cut out a shape from my Spellbinders and taped that onto the stool and then I painted the whole foot stool with some patio paint furniture (any paint that can go on wood is fine). I also cut out a scalloped edge that I taped on the stool before painting and on the sides I did the same thing by punching out a circle (1 3/4") taping it on the stool and then painting over it in a lighter shade of pink. After masking and painting the stool - I took the masked shapes out to reveal the shape in white on the stool. 2. With my stamp-a-ma-jig, I aligned the bear and stamped with Staz-On Black. 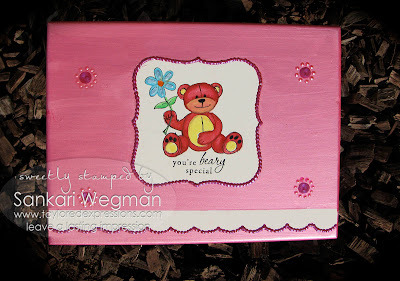 I did the same kind of alignment with the flower stamp so that it could be stamped as if the little bear was holding it and also stamped the sentiment "You are Beary Special" in the same way using the Stamp-a-ma-jig. 4. Stamped the sides with the heart stamp from this stamp set and then painted it. 5. I used my stamp-a-ma-jig again to stamp the images with the Staz-On Black ink again so that if any of the outline got covered up in the painting process, it would appear again. 5. Outlined the spellbinders shape, scalloped edge and the circle on the side of the stool with liquid pearls. 6. I took the pictures while still wet :) so I didn't have a chance to paint a clear finishing glaze over the whole stool, which will not only protect it, but also will not allow the stamped images or colors to fade. I also made a matching card for the gift using the June 20th Key Ingredients paper. The bear and flower were paper pieced from these sweet papers. I used the same motif of outlining with the liquid pearls and finished off the flower with the candy dots that are part of the June Key Ingredients pack. Ink: Chocolate Chip from SU! Don't forget that if you aren't already signed up for the SASI newsletter - you can click the button on the right sidebar! Thanks so much for dropping by :)! omgosh! She's going to love that stool! Super cute! Ditto on the AWE-mazing, Shawnie! This is FANTASTIC!!! the card is sooooo cute! I am new at card making and I am just wondering if there's a step by step tutorial to how you made this card? HI Sharon! Thanks for your question! I will post the step by step instructions here later on and also email it to you!! Thanks for your sweet comment! Oh my Sankari! The card is super adorable but I think the little pink stool takes that cake. Awesome!!! You're BEARY talent, girl!!!!! This would make a sweet gift for a little girl. Is there something you're not telling us? Yes I bet Uma is coveting that stool. I would be. Sankari. My how do you find the time?! Hope to see you at Surya's surprise lunch. What a sweet gift and card . I'm sure they will love it! Wow, that is such a great gift and so much more special than a store-bought one! Thanks for telling us how you did it! Big sister is going to feel so special when you give her her gift. This is something that she will probably have for a long time to come. Great job! Oh gosh, that stool is to DIE for!! You are truly amazing Sankari! This is AWESOME in every way!!!!! The stool as well as the cards are wonderful. Would you mind emailing me the step by step instructions. I will give you all the credit. They are adorable!! Do I need to send my email to you? I have never blogged before, so not sure how to go about this. I usually just look at all the wonderful things.